White-tailed deer (Odocoileus virginianus) are swift and stately animals prevalent from northern South America to southern Canada. At a quick glance it might sometimes be hard to tell a female from a male. But male and female white-tailed deer don't look identical, and there are ways to make gender identification. White-tailed deer are herbivores who tend to be diverse in their choices of living environments. These mostly nocturnal animals live in many settings, including agricultural sites, plains, wetlands, forests, thickets and mountains. They often live right alongside humans. White-tailed deer usually can to new surroundings with ease and swiftness. Their diets usually include components such as acorns, twigs, foliage, lichens, herbs, buds, corn, seeds, nuts, berries, shoots and grass. 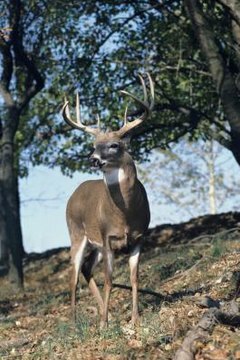 White-tailed deer are sexually dimorphic, which means there are clear differences in how the sexes look. Physical size is an important clue. The males are significantly bigger -- usually by roughly 20 percent, according to the website for the National Museum of Natural History at the Smithsonian. Males usually weigh between 100 and 300 pounds, while females usually weigh between 85 and 130 pounds, notes the Minnesota Department of Natural Resources. At certain points of the year, the genders are easily distinguishable because of antlers in the males. The sizable antlers of male white-tailed deer are hard to miss during the warmer months. However, they promptly drop off in the wintertime. The antlers emerge adorned in smooth "velvet," although that wears off at the end of the summer or the beginning of fall. Velvet is made up of delicate skin that has light amounts of fur. In rare cases, females possess antlers, although the frequency often relies on the location. In some locales, one in every 65 female white-tailed deer has antlers. In others, female antlers are much rarer. The growth in females typically results from increased testosterone. Female antlers usually aren't as sturdy and sophisticated as those of males, although there are exceptions. Sometimes it's easy to tell male and female white-tailed deer apart by simply looking at their company. Females look closely after their offspring, and they start teaching them how to search for sustenance when they're roughly 4 weeks old. If you see a white-tailed deer with one or two youngsters tagging along, then there's a strong chance that you're looking at a female.